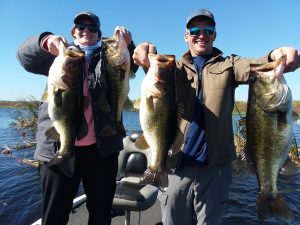 Ryan Matylewicz and Kelsey Sands from Pa. had an awesome day on Lake O catching nearly 40 bass with 3 over 5 lbs. and 1 over 6 lbs. The morning started out 36 degrees but by about 9 am the temps were quite nice and the fishing was fantastic. 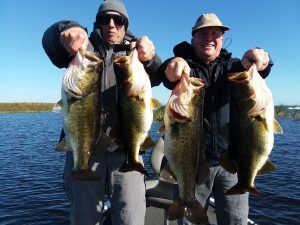 These guys have been fishing kayak tourneys up North all Summer and Fall and have never seen big bass like these. They have vowed to comer back next year and I look forward to seeing them and possibly an engagement. 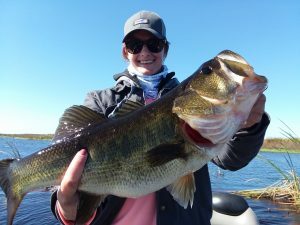 Kelsey caught this 6 lb beauty on a live wild shiner using a Shimano Stradic Reel, G Loomis rod, Power pro line, she is also wearing Costa Del Mar sunglasses. 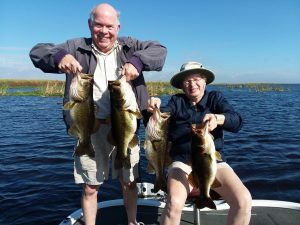 Richard Herr and his wife of 40 years came fishing with us this week and what a day they had! We caught several very nice fish with a total of 37 bass in 4 hrs on live wild shiners. This time of the year the fishing and weather is perfect. The wild life such as gators, ducks, coots, red-wing blackbirds and more are all enjoying the cooler weather and can often be seen out and about enjoying the day. I really enjoy taking people on the lake who have never seen it and hearing them later describe the lake to their wives and loved ones. Many clients say that this trip has been on their bucket list for years so having the privilege of taking them for that trip is awesome to me. Art Nor has become a regular with with OkeechobeeBassFishning.com/ Shellen Guide Service. 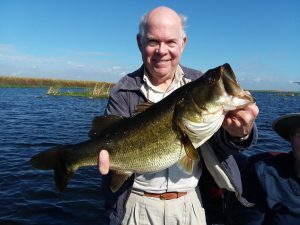 He and “doc” had an awesome day catching 33 bass in just 4 hrs with several fish in the 4-5 lb range and 1 over 6lbs. 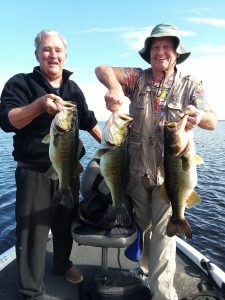 The cold weather hasn’t made the bite go cold so come on down to catch some Okeechobee Bass with friends and fam. These fish were all caught on live wild shiners. The water temp. has dropped some and the fish are turning up in droves it seems that each day has been getting better and better with several fish each day in the 5-6lb range and an occasional 7 or better. 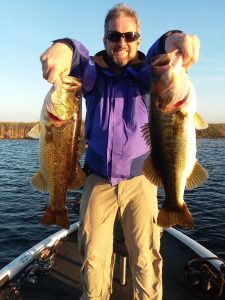 If you have always dreamed of fishing Lake Okeechobee now is the time to book your trip of a life time with Okeechobee Fishing Guides! Ralph Wood from Atlanta and his friend from childhood Scott from Jupiter Fl. both enjoyed there days out on the lake. 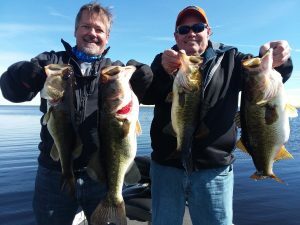 Both Scott and Ralph caught their personal best during their 2 days with Okeechobee Guide Service. I spent much of our time together laughing over there childhood stories. Scott spends a lot of times of shore now that he is living in Jupiter. It was a bit cold the last 2 days but the fish played along and ate VERY well for us. 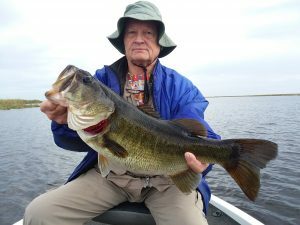 If you are thinking of coming down for the winter season come visit Okeechobee Fishing Guides and enjoy some Okeechobee Bass Fishing! Louis Gubser from Switzerland caught several nice fish today although the weather is cooling off the fish are still chewing! He caught 18 fish on live wild shiners and another half dozen on artificial. Now that the water is finally cooling off the BIG females will start showing up to feed. The crappie fishing has started off slow this year but should quickly start to pick up now that the water temp. has finally dropped. With all the bad publicity from “algae” this year the fishing has still been great. The native grasses are starting to come back and as they do the fishing will continue to get better and better. We are still averaging 24-40 fish a day with some days being better.